A man who law enforcement sources called "emotionally disturbed" has been arrested after anti-Semitic graffiti was scrawled inside a Brooklyn synagogue on Thursday. Checkey Beckford reports. A man who law enforcement sources called "emotionally disturbed" has been arrested after anti-Semitic graffiti was scrawled inside a Brooklyn synagogue on Thursday. Police say James Polite, 26, was taken into custody Friday afternoon, less than a day after the hateful messages were discovered by a congregant at the Union Temple in Prospect Heights around on the second and fourth floors of the house of worship. Law enforcement sources said the Brooklynite also allegedly lit several fires in the area -- including at another synagogue -- early on Friday. He's charged with hate crime criminal mischief and making graffiti. Thursday’s messages prompted the synagogue to cancel a political event hosted by “Broad City” star Ilana Glazer. A video posted to Instagram shows Glazer addressing a crowd. Glazer was scheduled to moderate a talk with a journalist and New York state senate candidates. 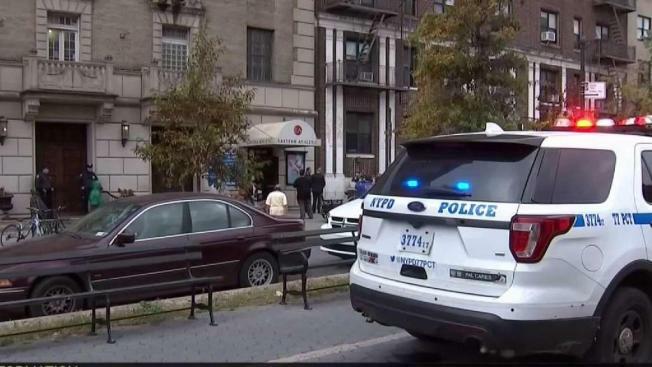 Hate-filled messages were scrawled inside the Brooklyn synagogue, the latest incident in a string of alarming attacks on New York City's Jewish population in the borough, police say. Neighborhoods in the borough have been the targets of anti-Semitic acts in recent weeks. Several days ago, swastikas were found in Brooklyn Heights and last month a man was charged with assault as a hate crime in a beating of a Jewish man in the middle of a Borough Park street. In response to Thursday's grafitti, Mayor de Blasio said that the NYPD would be stepping up patrols in the area for the next several days. Acts of hate against Jews have also been on the rise across the country. In February, the Anti-Defamation League reported that the number of anti-Semitic incidents against Jewish institutions rose nearly 60 percent last year over 2016, the largest single-year increase on record. The man’s arrest comes just under a week after a gunman stormed into a synagogue in Pittsburgh, killing 11 people.